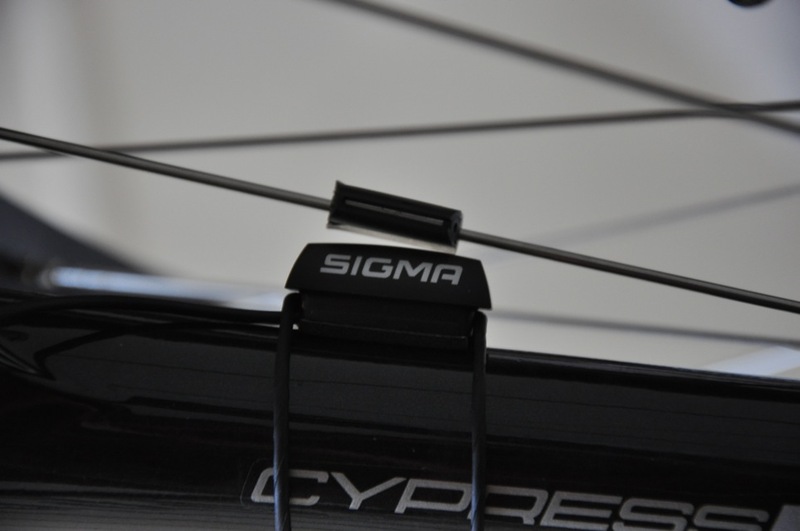 Sigma BC 506 mounted on bike handle. Last weekend I purchased a much needed bike computer. As a first time casual rider, I wanted to keep track of the time spent, mph and most importantly, total number of miles traveled. After looking online for a suitable computer, I finally opted to go with my bike shop’s suggestion. The second thing I want to cover is installation. I read online that people have spent close to two hours installing this model or other similar products. I will tell you right off the bat: have a qualified bike shop install it for you! The main advantage of purchasing the BC 506 at my bike shop was that they install everything on my bike for the life of the bike. Period. I am willing to test, however, if I purchase a product outside their shop if they are willing to be equally kind to install it for me. Wires neatly wrapped around brake wires. 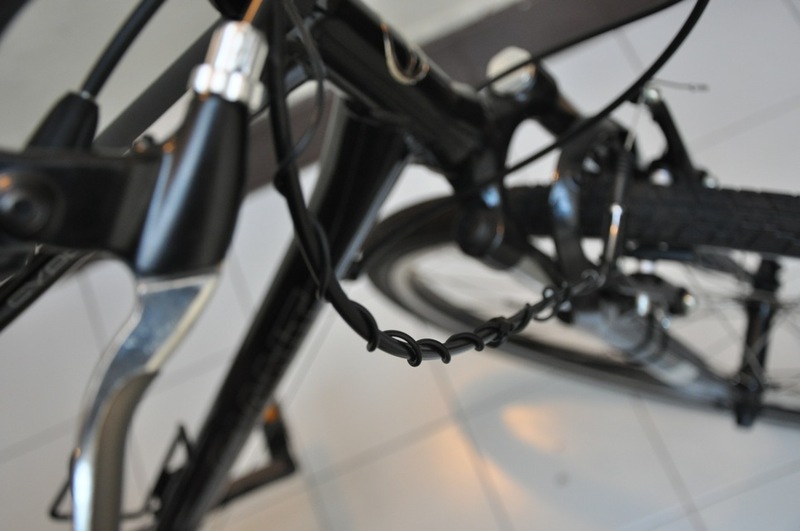 The sales clerk mounted my bike on his special maintenance rack and within 15 minutes, had the unit installed, wires wrapped around cables, magnets affixed and wheel calibrations set. He said that they have a special computer or gadget that does the calibrations for my specific wheel size which is paramount to the unit working perfectly. Any mistakes and I will get erroneous readings on the computer. I consider myself a pretty smart guy, I can read and most definitely know how to follow directions. But the tiny manual has several pages dedicated to wheel size and wheel size charts and how to input them into the computer. I am SO glad I was spared all of that. Pages from manual depicting wheel size and charts. It was time to put this baby to the test on the rode. Today I rode up and down Westchester County’s South County Trail near route 9A and the Saw Mill in NY and took the computer with me. I instantly liked that it has a twist lock system which enables me to simply twist the unit off the bike with a click and put it in my pocket, thus preventing theft (useless to the thief without the other components though). This was a neat feature I didn’t know about. 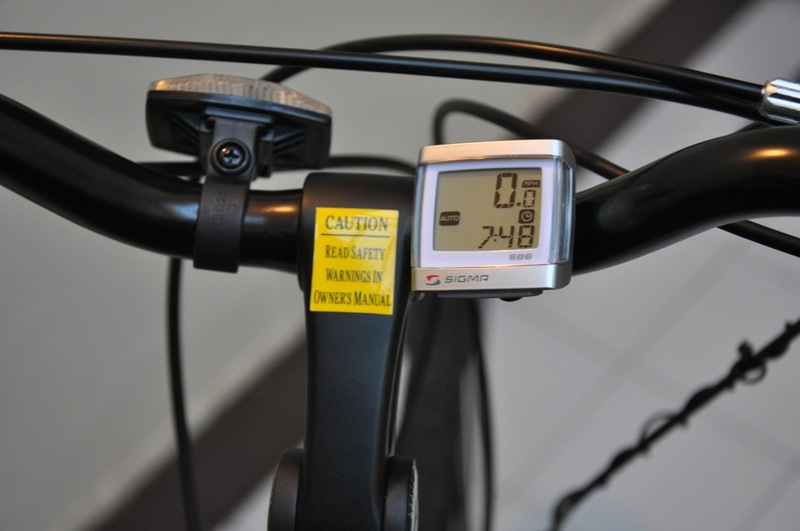 The BC 506 basically has five functions: speed, distance, total distance, clock, and ride time. Perfect; nothing more and definitely nothing less. It has a clear, crystal display with digits very easy to read. Dominating space on the display is the speed. I averaged 12 mph (can be calibrated for Kph). 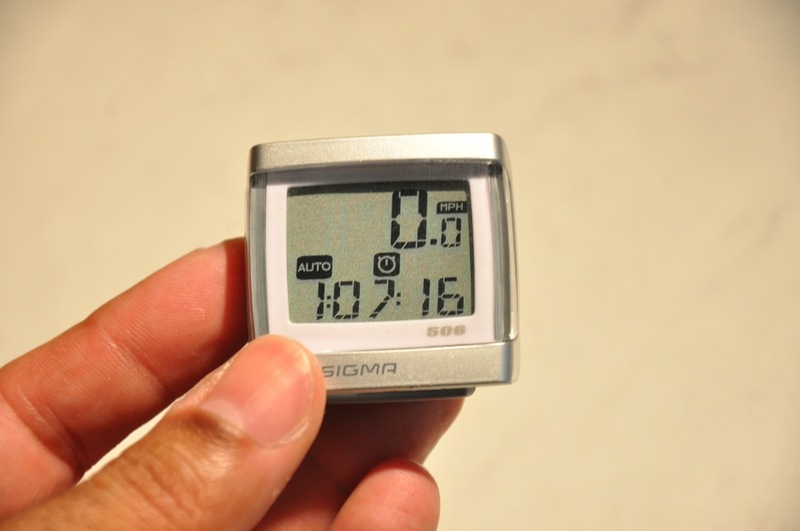 Second is the clock function which is great because it means I no longer need to wear a watch (my wrists tend to get sweaty) during my rides. You can set the unit to auto scroll so that it cycles between all the various funtions at 2 second intervals by pressing the single rubber button at the bottom of unit. The speed readout always remains at the top right of the screen. 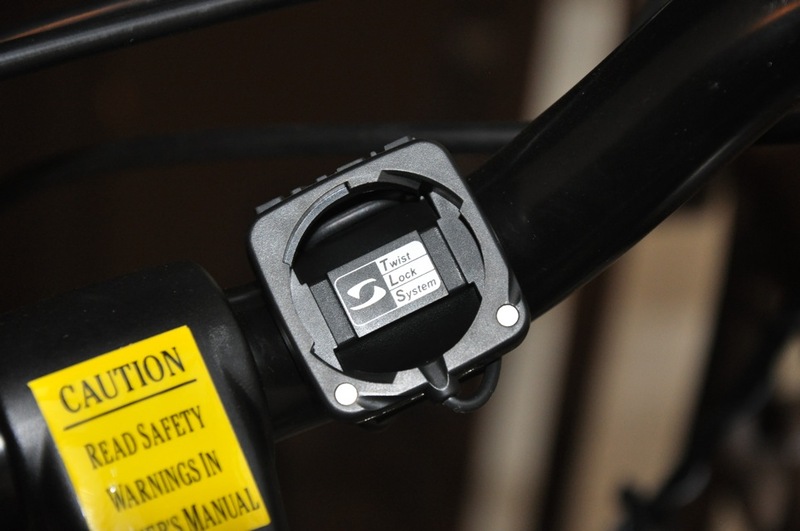 Two-piece spoke magnet set and bike sensor/receiver/mount. The only other thing worthwhile mentioning is the magnet attached to the wheel spoke. I was advised to keep an eye on it from time to time and to make sure that it is almost touching the sensor but not quite or else I’ll get the wrong readings on the device. I asked him if it will slide down as time passes and he assured me that it won’t. If that were to ever happen or if I should have any issue with it, they will wholeheartedly will take a look at it and make sure everything’s okay. When I stop the bike to drink some water or to take a break, the computer stops and keeps in memory all the information. It only records when I’m riding. Sounds like a no-brainer but it wasn’t that obvious to me at the time. Even after I detached the unit and took it home, all the information was still there. Simply holding down the button for 2.5 seconds resets the whole unit, ready for the next ride. When not in use, the defaults to displaying only the time. It runs on a 3-volt CR2032 lithium battery (included) which lasts for about 2 years. One word of caution however as stated in the manual: record the wheel size and total distance before changing battery. You will lose this information and you’ll have to re-enter it! Also, the time must be re-entered as well. There isn’t much more that I can say about this bike computer. If you need to buy one, this is the one to go especially if the price remains low as posted on Amazon. If you want to install it on your own, give it a try. Physically, it isn’t that hard at all. It’s figuring out how to input the right information for your specific wheel size that will prove to be challenging. Don’t bother to get any other bike computer that offers more than the five functions mentioned if you’re an average, casual rider. I hope this review proved to be helpful to you. I’ve a question. My spokes are made of PVC material. Will the spoke magnet fit on them? The magnet is actually clamped around the spoke, with the actual magnet pointing outwards towards the second one. It should be fine on your bike. I have a tricycle with the PVC type spoke. The “spoke” is shaped like a fan blade. Can the small magnet fasten onto the fan spoke without having to completely encircling it? Is is like a clam shell that closes? I am sorry I am so ignorant. Getting old and stupid I guess. Don’t be too hard on yourself, Steve! These are good questions. Now that you mention that the wheel spoke on the trike is a fan blade type, I am now not so certain that it will work out for you. Please click on the picture of the two magnets on the wheel that I took. You will get an enlarged shot and there you can see that it actually wraps around the spoke. I don’t know if this will do for your trike. Perhaps it’s better to forgo this bike computer for your trike. You you could edit the blog name Sigma BC 506 Bike Computer Cyan Skies to something more suited for your subject you write. I enjoyed the blog post however. I really enjoy mine, although I have to admit that I haven’t reset it yet, as I don’t know where my booklet is, and I don’t know whether it matters which of the 2 buttons you hold down for 2.5 sec to reset. The bike store discovered that the parts that go on the spoke and fork had gotten out of alignment and he gladly reset them and didn’t charge me anything for even coming in and interupting his day. Maybe I’ll get myself one of these for my summer bike. Next week I’m gonna get myself a winter bike, so that I can ride all year. The winter bike has to be a cheap one, because in this country they are so unbelievably stupid that they put salt on the roads during the winter. This results in damaged cars (rust) and an damaged environment. I totally agree with you on the points you mentioned. My local bike shop IS fabulous. I just feel that if I could save some money by buying online, I could do so. I spend enough money in the local bike shop, that an occasional online purchase wouldn’t be so bad. Even after purchasing elsewhere, they were cool enough to STILL install it for me! Thanks for dropping by and have a wonderful New Year! is it waterproof or water resistance? Hey Zach, I never rode my bike in the rain so I can’t accurately answer that question. I no longer have the original documentation so I can’t say for sure. I have a sigma 506 and it is not recording anything. Do you know what could be wrong with it? I recently experienced the same problem just before my Five Boro Bike Tour and right after the shop did some yearly maintenance on my bike. When I took it back, they showed me that the magnets on the wheel spoke weren’t aligned. He simply twisted the magnet around the spoke and then spun the wheel. Voila! Instantly fixed. I wish I had known that prior to my bike ride! Just making sure that magnets are close to each other but not touching. Click on the image in the post to see the position. That’s how it was first installed. If it doesn’t work, take it in to a bike shop. They should fix it quick and hopefully at no charge (if you purchase an item or something). Let me know how it turned out. I have the same model, thanks for the info. 15 bucks for installation, setup, good advice from your bike shop on getting the cheaper model, and getting it right away seems like a bargain to me. I’d really like to be a part of group where I can get suggestions from other knowledgeable people that share the same interest. If you have any suggestions, please let me know. Kudos! Sorry Edmundo, I don’t know of any forums that discusses this particular bike computer or any other for that matter. I’m sure there are some out there but I have no knowledge of them. Thanks for dropping by though!